Kloie Greene (center) sits alongside her mother, Kelly Greene (left) and varsity softball head coach April Yandle. 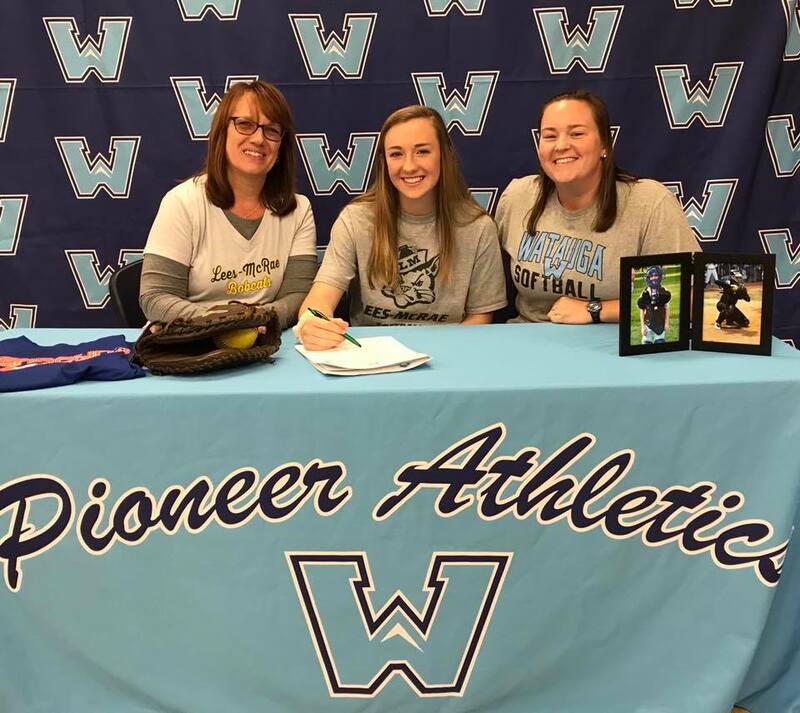 Watauga High School senior Kloie Greene made her college choice official on Monday when she signed her National Letter of Intent to continue her softball career at Lees-McRae College. “Kloie has been a dedicated, hard working and selfless teammate since her freshman year of high school. She has the ‘team first’ mentality which she has demonstrated by playing numerous positions when asked,” said Watauga varsity softball head coach April Yandle. Greene’s main position has been catcher, however she has also spent time playing in the infield at second base and even positions in the outfield. At the plate, Greene has a reputation of being able to do a little bit of everything. Greene is planning on entering the nursing program at LMC while getting to continue her softball career at the next level. “I’m excited for her to play ball at LMC. She has worked hard to achieve her goals of playing college softball and she’s taking the necessary steps to achieve her goals of working in the medical field,” Yandle said. “She wants to use her knowledge and skills to help people in need in third world countries. She’s a great player and teammate, but she’s an even more incredible young lady. Greene still has her senior season of softball to look forward to at Watauga this coming spring where she will hope to help the Pioneers build on a 7-13 season in 2018. The Bobcats are coming off of a 17-26 season in 2018.